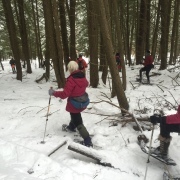 Please visit Jim Block’s blog to view photos from our snowshoe to the Bear Pond Natural Area in Canaan on January 23rd, in collaboration with the Mascoma Watershed Conservation Council. Thanks to all who took part that day! What do you find in a frozen bog? Vermont Housing & Conservation Coalition Legislative Day Voice Your Support of the Vermont Housing & Conservation Board!